iPhone !! sound very good. Very much expensive Smartphone ever. Not only expensive, it’s also some of our Dream phones if am I not right. We get very much fear when we thought about – “Oh my god!! My iPhone is damaged by the drop in the water”. Seriously it is a matter of deep thinking “how to fix water damaged iPhone” or “Repair water damaged iPhone”? Actually, this problem is most expensive to all because we are not a repair engineer, so how to fix water damaged iPhone we don’t know. But why? When every time we face some of like this problem, every time we have to pay money to a technician. Just think if it can be solved by yourself? Then you no need to hire a technician and also no need to pay him fees. Also, you become smarter than the other. the time when it happens” I mean just a primary First Aid. It’s very useful to repair water damaged iPhone. Actually, all these are not only for iPhone, you can use all this method in case of any other smartphone like Samsung, Nokia or BlackBerry etc. In result it might get some problem like “device will unable to turn on” or “it will getting restart sequentially” or “it will turn off automatically”. These are the common problem happen in most of these cases. sunlight. If possible put it as the same for 2-3 days. This is overall a primary suggestion I can give you, but actually, we have to do little more work on it to keep it safe. So just dive into becoming a technician. Immediately turn off the phone, to make the chance less of “short circuit”. Remove its cover (flip-cover or back-cover) and as quick as remove the sim from sim tray and sd card also. Keep continuously jerk it to get relief it’s trapped water. Don’t forget to wipe it with s dry absorbent cloth. You can take help of a pin, wrap it on the pin and try to lean or soak the water from its tinny parts like the headphone jack, sim tray, charging port etc. Try to do this as end as possible to keep your phone safe and put it very long on air. But be careful, don’t try to turn it on. N.B: One common matter just fixed in your mind that “don’t keep your mind on whatever others are advice” like put your phone in a rice drum or put it on a locker for few days etc. It all is never recommended. Now I start to describe a little bit more deeply. It is best for a technician and also for that person who wants to know “How a technician will do?”. You guys can try this but be careful, this is not any simple matter. If you want to learn and want to me make a future mobile repair engineer so you can obviously try this. First of all, you need some tools which are recommended and especially for the iPhone. [If you have all the tools for iPhone then you can easily take care of all of the handsets]. Hairdryer or a fan or a Blower to dry our the logic board. First of all, you need to remove all of it’s screw one by one and keep it safe because if anyone is lost then you will face the harassment. Then try to remove its screen from the front of it with the help of “iSesamoSeparating Tool”, also take care of it from scratches. Then you will see the battery inside it, so try to remove some another screw off its side and after that again take a little help of iSesamo Separating Tool to relies on the battery from it. After that try to remove carefully all its mini component like – sim tray, camera etc. Then, as a result, you will see the circuit board come in your hand. Now it’s the time to use Isopropyl. Try to wash the other component of the phone with brush and Isopropyl. Keep it in mind that have to clean all the phone. You have to protect from water damaged and also from short-circuit. So try it from your best level. Then you can try to soak it with a hairdryer and also a blower. But don’t use this blower on screen. Let it to fully dry up to last when you didn’t satisfy, then carefully assemble all parts one by one then check it. its software side. Don’t worried about its software part, I will discuss it. But as I explained above is also an overall method, you can see the video given below to understand it perfectly. Now I going to explain its software parts. Listen we all know that software is very much expensive so we all so to a software technician to load software on our phone or go to their for flashing it. Details of “how to flash a Smartphone” givenhere. Actually, the most common problem is you see some of your data will be deleted. Then we just need to recover the lost data with any recovery software. 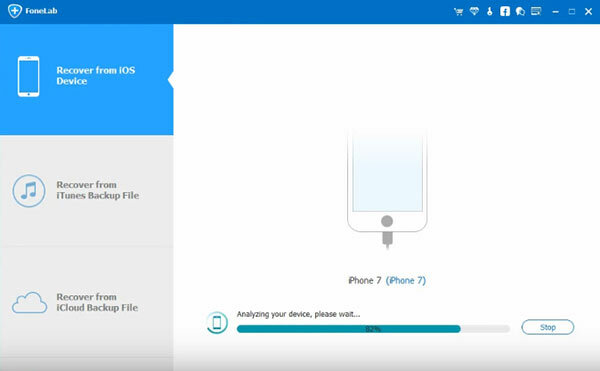 First of all, connect your iPhone to your computer and start iPhone Data Recovery software on the same computer. 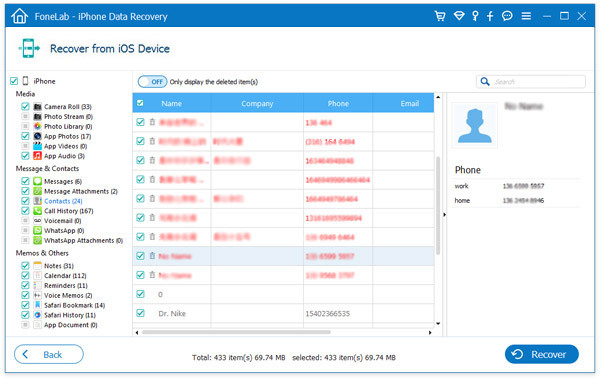 After detected the device automatically by the program select “Recover iOS Data” in “Recover” and a window will appear as shown below. Then click on “Start Scan” to scan your iPhone’s data. After that, you can see the preview of all the data and files. Select the data you want to retain and then click “Recover” to restore them to the computer. Note: Deleted data or lost data on the water damaged iPhone will be found by this tool as well. You can also choose which you like to recover. That’s all guise. It’s all I can explain to you. After that, if nothing happens seriously you need an expert technician. Now I am discussing some question answer which is mostly faced by a technician from the customer side especially in case of “Repair water damaged iPhone”. Question 1: My Smartphone’s speaker doesn’t work? It’s miles difficult to decide whether or not your iPhone’s speaker has been compromised through a way of water due to the fact there are frequently larger problems so that it will forestall you from noticing. As with every water associated trouble, go away your smartphone to dry for so long as viable. if you manipulate to reveal your mobile phone lower back on once more, backup your records before you try to check the speaker out. If there may be water for your speaker, the use of it could purpose the telephone to quick. if you’ve grown to turn out to be your iPhone again on after letting it dry for so long as you could, try to play a ringtone or a few kinds of music through your speaker. this will permit you to understand if there is an trouble, but, it has to be one of the remaining matters to test as a way to avoid your cellphone shorting and inflicting more harm. Question 2: My smartphone not charging? In case your not charging price after losing it in water, there might be a problem along with your charging port, particularly if that changed into the main area that water entered the cellphone. The charging port is one of the few locations that has exposed electric components, so there is lots of capacity for corrosion. in case you’ve eliminated water damage as a problem, there may be an issue along with your iPhone battery. Question 3: How an awful lot do water-related maintenance price? Apple does not cowl this under their guarantee and if you have AppleCare+ you may be charged $92 and a possible excess to get an alternative telephone. instead, at iSmash we fee $23 to run liquid harm diagnostics take a look at that can soak up to 48 hours. Following our analysis, one of our licensed iPhone repair technicians could be capable of perceiving exactly wherein the issue is and whether or not it is able to be fixed or a refurbished replacement is the way to go. If you try the method above I explain about “Repair water damaged iPhone“, it makes you less budget. At last, various types of process are available in the market to Repair water damaged iPhone. So you can comment me about your process in detailed. So it’s will help to all other reader and me also. I discuss the details of your method in my another article separately. Nice post, iPhone is very expensive and so sensitive when this phone is damaged by water then we feel so bad, but here you discuss how it recovers so that it will come back and again use this phone. Thanks for sharing and it will be helpful for everyone. Thank You So much, Priyanka.